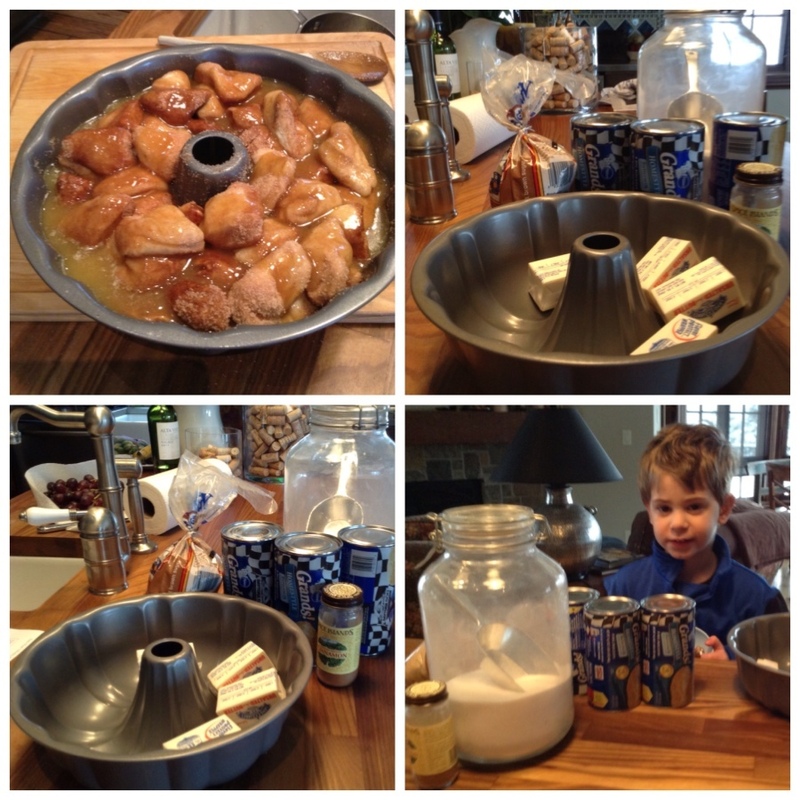 My grandson Brody and I were in the house and I wanted to do something in the kitchen which would engage him and give us both something to do together. This is a perfect cooking exercise to do with young kids, they enjoy making it and eating it. He is only 3 but he enjoyed doing the whole thing as much as I did. This is a super-gooey sticky buns type of cake, not sure about where the Monkey title comes from, but it is like a bunch of cinnamon munchkins melded together with delicious caramelized goo. If you’re into this , it’s awesome. Superbly caloric and probably the last thing in life any of us needs to eat, but super delish. Joel loved it as you can well imagine, as did my daughter, her husband and myself. No one is advocating eating this on a daily basis but every blue moon it’s wonderful. Fun for kids and great for a crowd, everyone can pull off a piece. It’s hard to stop pulling at it. You’ll want to let it cool down for about 30 minutes before you flip it over. I would use as deep a bundt as you have and not use a 2 piece tube because I would worry it would leak. Don’t fill it up to top with raw dough, only about 2/3 full because it does grow in the oven, and that would be a disaster in your oven if this overflowed. 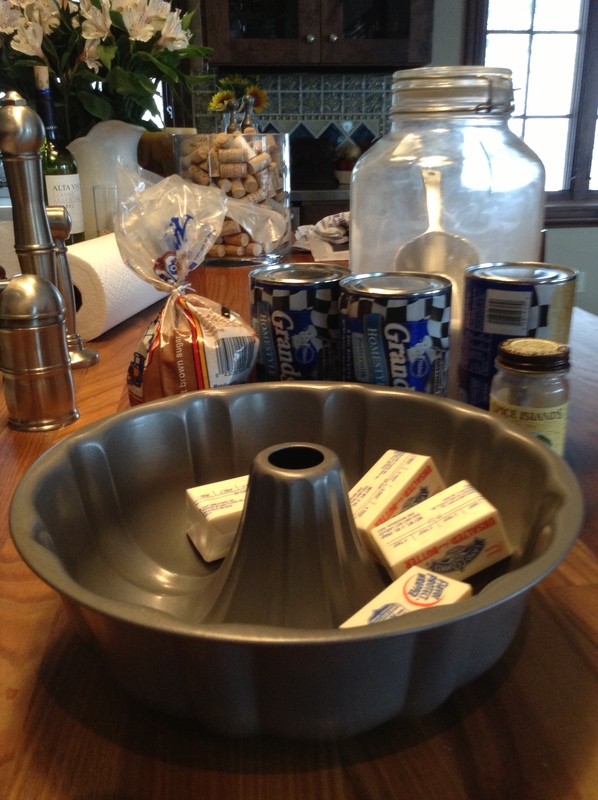 I also sprayed ( Pam) bundt pan well, and placed on a sprayed cookie sheet in oven just in case. I needed to cook it for about 60 minutes, you’ll want the top of it browned. If you eat it when it’s fresh it’s beyond delicious, just try to resist eating it when it’s too hot. The next day just microwave for 15 seconds and you’ll restore the goodness. Brody was so proud of his accomplishment and it really was a fun way to spend some time together. Don’t say I didn’t warn you about how highly addictive this cake can be. 2 – 3 cans of Buttermilk Biscuits ( non flaky kind) I could have gotten away with 2, I didn’t fill up past the 2/3 mark. Be careful! Start out with 3 cans . Preheat the oven to 350 degrees. Open up all 3 cans of biscuits and cut each biscuit into quarters. Next get out a gallon size baggie ( ziploc preferable here) and combine the white sugar and 3 teaspoons of cinnamon. Drop the raw biscuit quarters into the cinnamon-sugar mix. Mix as you go, till all pieces of raw dough are covered with cinnamon-sugar mixture, shake the bag hard and the pieces won’t stick together, a good vigorous shake. You want all the pieces as unstuck from one another as possible, good shaking will do this and nicely coat each piece with sugar mixture. Spray bundt pan well with Pam Spray, I used Baking Spray but original kind will work just fine. Spread nuggets out evenly in the bundt pan. In a saucepan on the stove melt butter and combine with 1/2 cup of brown sugar. Cook butter/sugar mixture , stirring for a few minutes until the two become one. Once the brown sugar butter has become one color, you can pour it over the biscuits. Bake for between 45- 60 minutes until the crust is a deep dark brown on top. When it’s finished cooking, remove it from the oven. If you have the willpower, allow it to cool for about 15- 30 minutes before turning it over onto a plate. Decadence. Pure and delightful. Enjoy! 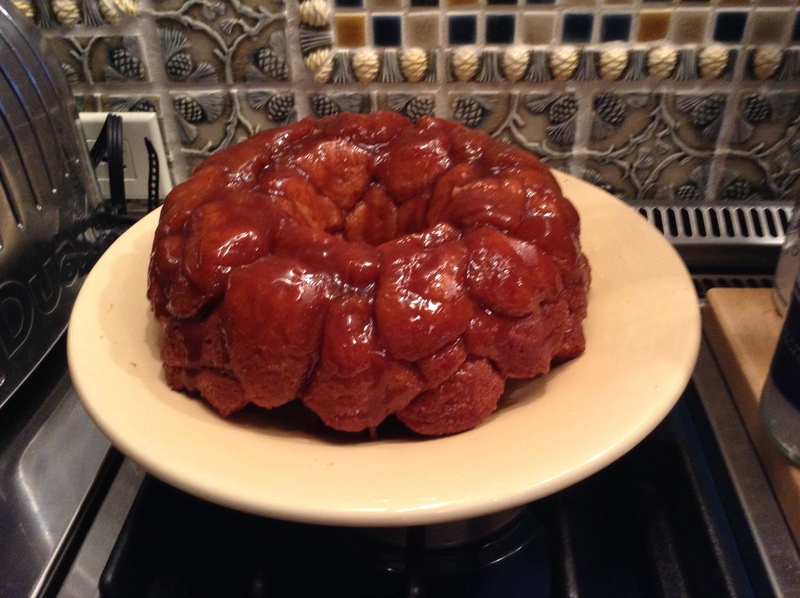 This entry was posted in Cake and tagged Cinnabon type of Monkey Bread, Monkey Bread. Bookmark the permalink. If you want to feel less decadent try adding a chopped Macintosh apple to the bread pieces before adding the caramel. This way you can convince your readers that this recipe is a little nutritious. Enjoy this variation some time.